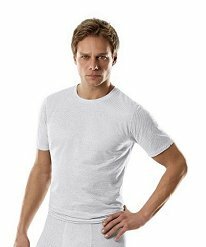 EMF SmartWear designer wear is our own line of eco-friendly, soft, natural cotton-like, organic apparel for stylish everyday protection from environmental EMF. The garments are designed with ingenuity that allows them to be worn multiple ways so one piece does several duties - one day a shawl, next day a tunic, or a cape, or a maxi scarf, or a vest, or a jacket, or a wrap around dress. Brilliant! Smartwear uses High Performance EMF / RF shielding fabric that our testing shows easily blocks up to 99% of RF radiation (depending on how snugly it is closed up) from such things as cellphones, cell towers, WiFi, bluetooth, wireless technologies, and more, in addition to EMF from electric fields like power lines, electrical wiring, appliances etc. EMF SmartWear designs feature roomy tops you can pop over whatever you are wearing that day, and go wherever you go. The Hooded Valero (pictured below), the SmartWear Wrap (pictured below), as well as the Hooded Scarves , or Scoodies, are all casual easy care, wear-with-anything, go-anywhere protection. Finally, EMF safe clothing you can wear with anything, go anywhere with style. One size fits all. Washable. Easy care. Dress it up, dress it down. The the ultra versatile EMF Smartwear Multi-Wrap (pictured above) is the hands-down, go-to favorite, since it cleverly designed to be worn multiple ways for any occasion - a wrap around shawl for evenings at the opera, a long vest with jeans and boots the next morning, and many other different stylish looks - above you see (L to R) the scarf vest, maxi scarf, evening coat (or day duster), roomy jacket, shrug, and wrap dress top. 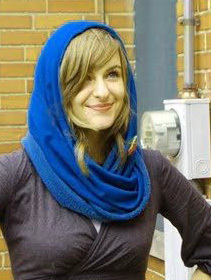 Cute, quick-fix Scoodies are the EMF protection you keep at hand in your purse for protection from unexpected confrontations with such things as environmental EMF (like the smart meter here) or an unavoidable cellphone call. Pop it on when you need to talk on your cellphone, and talk clearly right through your scarf as you stay safe (and perhaps headache-free?) from cellphone radiation. 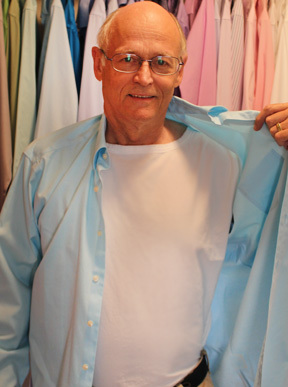 EMF SmartWear also offers skin friendly, soft organic cotton, under shirts, or "Under Shields", designed to provide high level EMF (RF) protection for your inner core organs, comfortably and discreetly under everyday clothing, in sizes for every member of the family. Need Quick, Cheap EMF Protection? 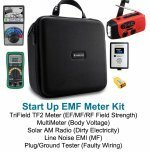 Why Not Make Your Own EMF Cover-up? 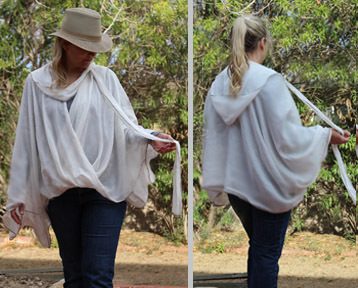 Check out our clever No-Sew EMF Clothing coverups so easy to make even a total beginner can create an EMF protective garment in a few minutes. You'll love our Do-it-Yourself EMF Shielding Togas. Simply buy 5 feet of the recommended (tried-and-true) fabric and cut it following our FREE pattern. 20 minutes project time. You'll even some fabric left over for a scarf too. Providing yourself this much RF-shielded coverage (>99% RF shielding!) 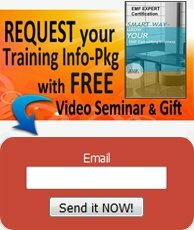 could not be easier, or less expensive. Great shielding from cellphones, wifi, smart meters and other radio frequency signals for the head, neck, and shoulders. Normal looking, soft and very comfy… especially in cooler weather. 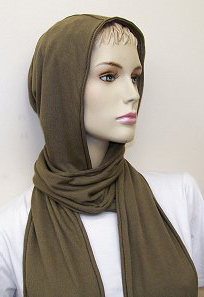 Medium brown color goes well with most outfits, and can be used indoors or out. SILVERELL® quality, made with pure silver and rayon. 90% RF attenuation tested up to 8 GHz. EMF Safeguard Apron - "Durable, Convenient, and Attractive"
Soft feel and gentle to the skin. Completely machine washable (no bleach) and dry-able (cool) without losing shielding performance. Generously cut for comfort and great "neck to hip" protection for pregnant women, computer and microwave oven users, TV or radio station workers, research and hospital workers, or anywhere people are exposed to RF radiation. Color styles may vary. This unique apron is constructed using special cotton based Staticot™ shielding fabric which is a highly effective E-field and RF shield, providing up to 40 dB to 10 GHz according to test results. 1000 Ohm per sq on the surface, so it is also great for static discharge and easy to make ground connections. You will look pretty in pink and smarter than a smart meter with this shielded women’s tank top blouse. Wear it alone or under a shirt or sweater. Straight fitting, knit fabric feels nice against the skin and contains just enough Silver to achieve a respectable 35 dB shielding. Radio-waves bounce right off. Protects torso and abdomen. Pink with white trim. 50% Silver and 50% Beechwood. Machine wash with TexCare (metal fabric laundry soap), hang dry (Large Size only) Sold out, check back for updates. 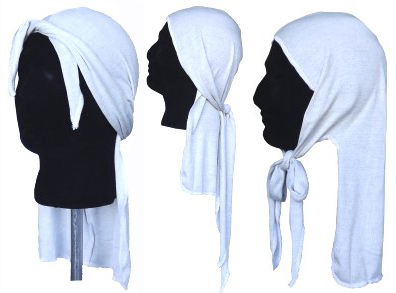 RF Shielding Head Wrap (or scarf) Unisex, Shields Head and Back of Neck - This shielded headdress can be worn several ways to provide coverage to the various parts of the head and neck. Very soft and comfortable against the skin, even for prolonged use. 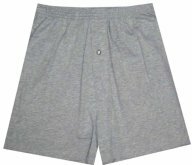 Suitable for daytime wear or while sleeping. 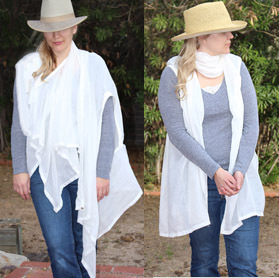 Very thin fabric with a slight stretch, it can be worn under another standard style hat or scarf. 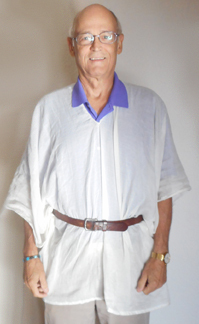 Includes a long drape for the back of the neck which can be tucked inside the collar of your shirt, or left exposed. Think of it as a “Doo Rag Bandana”. Provides 20 dB of shielding performance for RF/microwave radiation. Light gray color. Suitable for both men and women. Good RF shielding with Rayon and Silver fabric. Elastic waist band. Fly front with 1 button. Very simple design, suitable for men or women. Machine washable. These are truly remarkable! Reasonably stylish eyeglasses that offer radio frequency shielding. 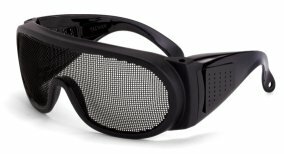 Metal mesh shielding alloy forms the lenses, permitting wide view visibility for driving, working, or relaxing (not for fine work). Can fit over most normal eyeglasses. They will never fog or smudge. Durable black plastic frames complete the design. Simple effective. Give your eyes the rest they need. Shielding performance: RF: 20+dB (>90% reduction) tested at 50MHz and 900 MHz. Coveralls with Hood - Clean room type coveralls provide RF shielding to entire body. Zipper front makes getting dressed easier. Elastic at waistline and all 4 cuffs. Breathes well, and moves with your body. Uses specially-woven gray lining fabric containing corrosion resistant, micro-fine stainless steel fibers and provides >97% RF shielding!